(Reuters) - A Florida doctor has admitted, as part of a plea deal, that he received kickbacks from Insys Therapeutics Inc in exchange for writing prescriptions for a powerful fentanyl-based pain medicine. Dr. Michael Frey, 46, pleaded guilty on Monday in federal court in Fort Myers, Florida, to conspiring to receive kickbacks from a medical equipment provider and a pharmacy sales representative. As part of a plea agreement, he also admitted that Chandler, Arizona-based Insys paid him kickbacks in the form of fees to participate in largely bogus speaker event programs so that he would prescribe its opioid product Subsys, prosecutors said. "This was an alarming case of a physician who abused his position of trust for money," U.S. Attorney Chapa Lopez for the Middle District of Florida said in a statement. Under his plea agreement, Frey agreed to cooperate with authorities in their investigation of other people. He also agreed to pay $2.8 million as part of a related civil settlement. A lawyer for Frey, who co-owned Fort Myers-based Advanced Pain Management Specialists, did not respond to a request for comment. Insys also did not respond to a request for comment. The plea came amid a wave of related criminal cases centered on the drugmaker's opioid product Subsys against medical practitioners and former executives and sales representatives employed by Insys, including billionaire founder John Kapoor. 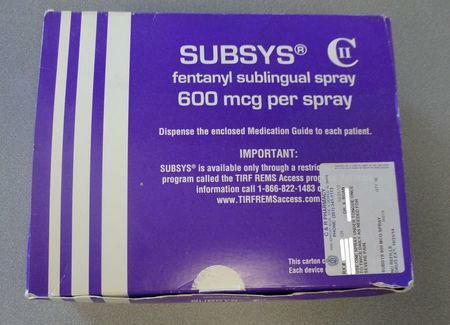 Subsys is an under-the-tongue spray that contains fentanyl, an opioid 100 times stronger than morphine. It won U.S. approval in 2012 for use in managing pain in cancer patients who were already receiving opioid therapy. The U.S. Justice Department has accused Insys of paying kickbacks to doctors nationally to prescribe Subsys, often via fees to participate in sham speaker programs ostensibly meant to educate medical professionals about the drug. In addition to receiving payments from Insys, prosecutors said Frey engaged in two other schemes that allowed him to earn $472,113 in kickbacks. In one, Frey beginning in 2010 received compensation from the owners of Florida medical equipment provider A&G Spinal Solutions LLC in exchange for referrals, prosecutors said. The scheme allowed A&G to receive $803,007 in reimbursement from the government healthcare programs Medicare and Tricare, according to court papers. A&G's owners, Ryan Williamson and William Pierce, have pleaded guilty to paying Frey kickbacks. Prosecutors said Frey also accepted bribes from a pharmacy's sales representative to prescribe compounded pain creams.